Once again, an important national holiday in the TeenyLittleSuperChef household has come and passed, and I was completely unaware of it even being in existence until just now. How could this possibly happen? Was anyone else aware that February 3rd was National Carrot Day? How could I have not known? Seriously! I am the ultimate carrot connoisseur. The master of all orange root vegetables. The supreme daucus carota officionato. If the carrot was a college, I would be the Dean. If the carrot was a country, I would be the President. If it was the best TV sitcom from the 1950’s, I would be the Desi Arnaz… I think you get my point. Carrots are the end-all, be-all of my existence and yet somehow, the one special day that is dedicated to my beloved little orange beauty came and passed as though it were just any other day. You would think someone would have sent me an e-mail or a card or at the very least, Facebook messaged me. What’s it take for a little guy to get Tweeted these days. I mean, come on. Alas, while I should have been spending the 3rd of February celebrating the almighty carrot, instead I was nursing my post Super Bowl party hangover and preparing for what I thought was the next most important holiday, National Organ Donor’s Day. No offense, organ donors, but carrots take the cake when it comes to random things being honored. Speaking of cake, is there anything more awesome than carrot cake? Well, other than carrot cake in cupcake form? I think not. So even though I’m over three weeks behind in celebrating this momentous occasion, I’ve decided it’s still better late than never to do my part. Therefore I’m declaring today, February 27th, as National TeenyLittleSuperCarrot Day. Yay!!! 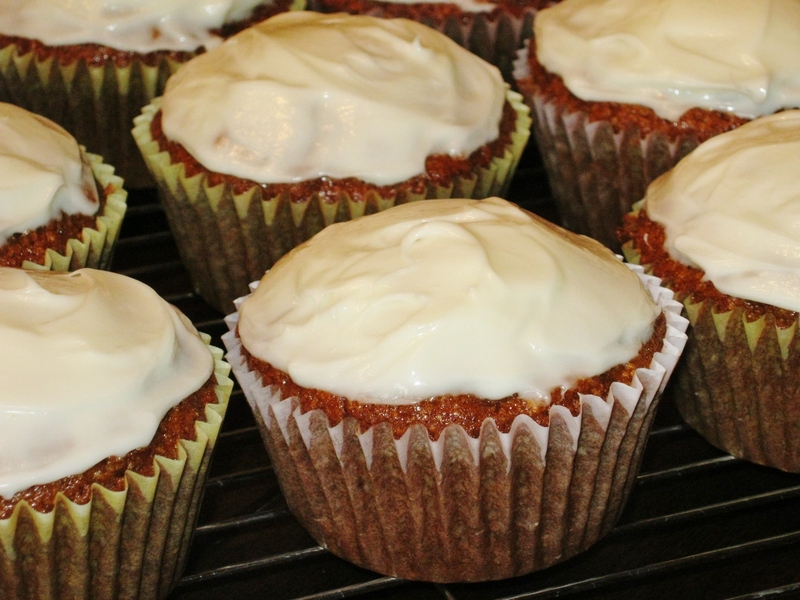 So crank up those ovens and get ready, because it’s carrot cake cupcake time. 1) Pre-heat oven to 350 degrees. Line 12 muffin cups with paper liners. 2) In a medium bowl, combine the flours, baking soda, salt, cinnamon and nutmeg. Set aside. 3) In a large bowl, combine the eggs, canola oil and brown sugar. Stir well. Whisk in the applesauce, vanilla and carrots. 4) Add the dry ingredients to the wet and stir until just combined. Fold in the walnuts. 5) Pour the batter evenly into the muffin cups. Bake 20 minutes or until a toothpick comes out clean when inserted. Remove from oven and transfer to a wire rack to cool completely. 6) To make the frosting: Beat together the cream cheese, powdered sugar, lemon juice and zest with an electric mixer until smooth and creamy. 7) Frost the cupcakes and sprinkle with the remaining walnuts. Well compadres, I must be going now. I’ve got a whole plate of orange deliciousness waiting for me to devour, and only 6 more hours left in the day to do so. Happy TeenyLittleSuperCarrot Day, mi amigos! P.S. If you’d like to buy me or one of your loved ones a muy bonita present in celebration of this day, check out this delightful, authentic Louis Vuitton purse mi tia Marisa is selling on E-Bay! Perfect for taking a stroll through the dog park mall. I can’t believe you’re just sitting there and not devouring those carrots. Is that a tear in you eye I see? I promise to always have carrots when you come to stay with us. Love you, Teeny!! 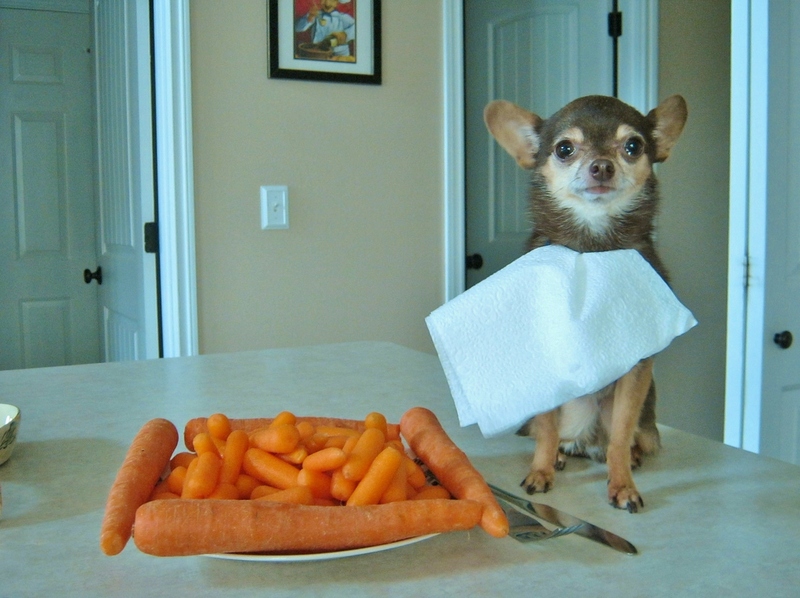 Love your photo, shame, such a little dog and so many carrots…..
Not to worry, I attacked that plate as soon as the photo shoot was over. That is such a great photo — the napkin is hilarious! I may be an animal, but I still like to practice good table manners.